“Business is about people and if you want to invest in anything, the best investment you can make is in people”. Graham Benton, Lishabora Founder, and Managing Director have no doubt: “When you create an organization you need to first create a group of people working towards a common goal. As a leader, you need to ensure that there is a shared vision and everyone is pulling in the same direction. That’s why I am happy to invest in my team abilities and skills. There is no more critical asset”. Graduating in Environmental Studies and Adventure Education from Prescott College in 2010, Graham started his career as a sailing, scuba and marine science instructor in the Caribbean to bring science education to high school students. He started as an intern and ended as program director, promoting marine stewardship among youth. “Unfortunately,” he recalls now, “I realized that I was teaching America’s wealthiest youth how to sail and that aspect wasn’t fulfilling. I felt I wasn’t having the impact I was looking for, so I made the decision to work with a different population where positive change would be more meaningful”. In 2011, he joined a friend in Kenya and started a Pay as you go-biogas company with the aim of enabling small, rural farmers to have access to renewable cooking energy. This 4-year experience in rural areas made Graham aware of how smallholder farmers were taken advantage of. Founding LishaBora, he set out to break the barriers that exist between rural agriculture and prosperity. The informal sector makes up 70% of the dairy market in Kenya, and 90% of smallholder dairy farmers are part of this sector, contributing to 7% of Kenya’s 70 Billion USD GDP. Because of many inefficiencies in the system, smallholders live below the poverty line and earn only 2 USD per day: inadequate equipment and manual bookkeeping practices lead to a reduction in profits for both micro-entrepreneurs who buy and sell milk and farmer. The biggest challenge was finding the real cause of the problem. Graham explains: “I started by solving the problem farmers told me they have, but they are part of a system they don’t fully comprehend and they are in a situation that they can’t control. Micro-entrepreneurs can’t win if we don’t have a wider systemic approach: the big monopolies in the country are controlling the prices, price control causes a ripple effect, with feeds becoming more and more expensive because of the many middle points in the distribution chain”. Partnering with informal diary traders, Lishabora gave them a digital solution to manage their business and enable them to give better products and services to their farmer. At the same time, by formalizing and digitizing the milk collection process through a business management mobile application, LishaBora improves market access for smallholders and provides credit solutions to a segment of the population which had no credit before. 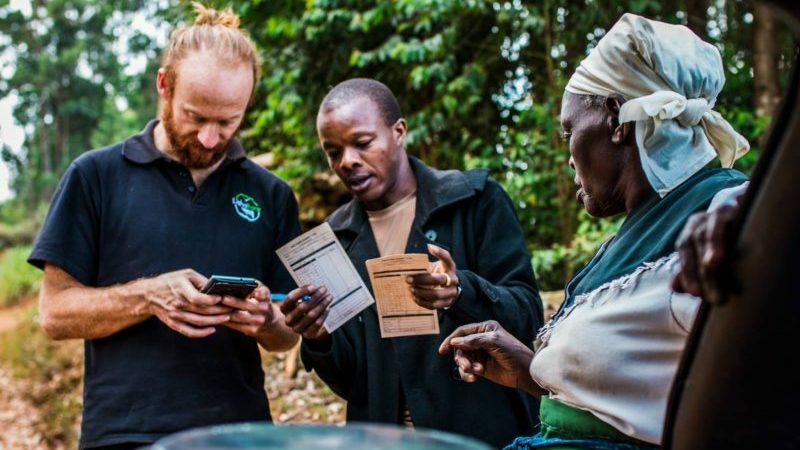 This management app frees time, builds accuracy and creates a historical record of transactions – making it all more efficient while at the same time building a credit score for both smallholders and traders. The traders working with LishaBora have seen an 85% increase in business and the farmers are getting the best of both the formal and informal market. Graham says: “We are in a place where we can offer a better value proposition and create true shared value. It is the potential that this business model has, that keeps me going even in hard times. Looking at the big picture, I see what it can be at scale, in terms of value and fairness. We need to change the status quo”. Lishabora today has 13 employees and Graham keeps investing in their development as much as he can. “I encourage them to always be on the lookout for learning opportunities, and I send the staff to training if they are interested in going”. Recently, Emily Achieng, Lishabora’s Finance and Administration Director, joined the Amani Leadership and Management program, running in collaboration with ANDE and the Argidius Foundation to develop leadership and management skills for middle and senior managers of SME’s in East Africa. “She is a lot more vocal, she stands up for herself, she is more than a commander, she is really a leader, with a stronger will and more drive. She is really acting as a CFO now” Graham says about the effect of the program on Emily. “The employees who are closest to her have seen the change and I can see her overall effect on the team”. “Even if our pain is still related to money, things change a lot more if you talk more about skills and less about money. So, I always try to work on funding, technology and people all at the same time”. What’s Graham’s vision for the future? “In terms of business, we want to increase tenfold, involving 10,000 farmers. At this scale, I feel we will be able to drive real systemic change. I don’t think we need to scale geographically at the moment. I’d rather want to lock the key people in the company. My aim is to share the ownership of the company with core staff to have them 100% on board”.